The NPV and IRR Template for Excel calculates the Net Present Value (NPV) and Internal Rate of Return (IRR) percentages for regular period cash flows. The NPV (net present value) of an investment is the current value of a future series of cash payments and receipts. The IRR (internal rate of return) is the interest rate received for an investment consisting of cash payments and receipts that occur at regular intervals. 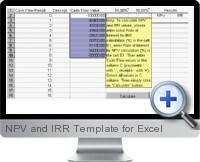 The NPV and IRR Template for Excel offers a quick method for calculating NPV and IRR based on regular period cash flows entered by the user. The template can be used with Excel 97 or higher.